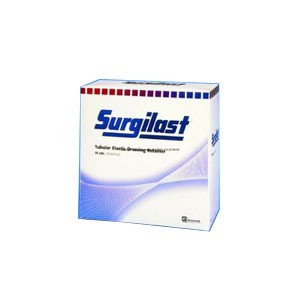 Derma Surgilast® Precut Tubular Elastic Dressing Retainer is made of nylon and rubber, stretch net material. Preshaped to accommodate the more difficult-to-fit parts of the body. Ideal for securing hot or cold packs, ear dressings, electrodes, etc. Derma Surgilast® Pre-Cut Tubular Elastic Dressing Retainer with stretchy material is comfortable for the patient. Can be cut to modify the fit and simplify the bandaging process. Ideal for dressing difficult areas without resorting to flat gauze and adhesive tape. Elastic net can be cut to open a space for monitoring leads, IVs or special applications.